When choosing a cover material for this Riviera Country Club wedding photography album, all aspects of the wedding were taken into consideration: the bride, groom and bridal party attire; the wedding venue / location; the ceremony and reception decor. This wedding was an absolutely stunning, formal, classic black tie wedding with a very neutral color palette. Even the gorgeous floral designs were largely ivory hued. However, there were some subtle blush and pink shades in the flowers, too. While a black or ivory cover would have certainly worked for this wedding album, it may have made for an album that was overall too neutral. So, a slight chance was taken on the heather leather color that was selected, and it turned out to be a great choice. 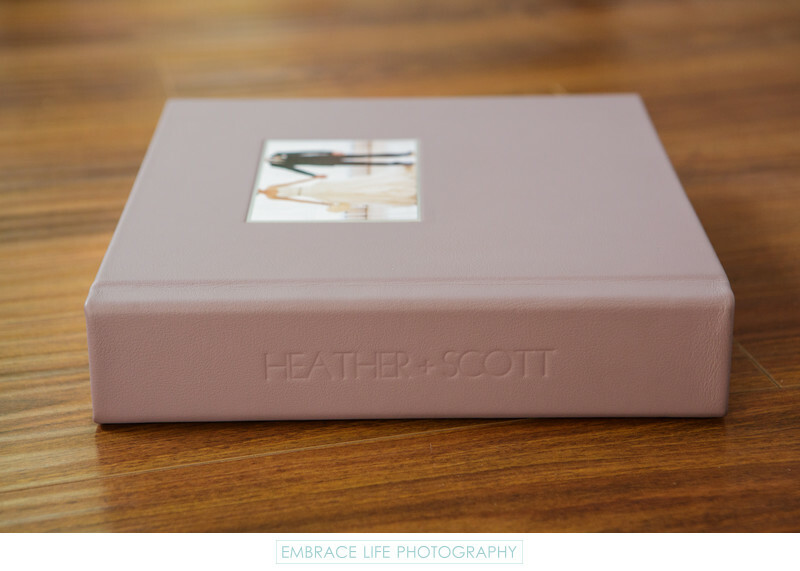 Additionally, the bride and groom's names are debossed on the spine in a modern font face, while the front cover is adorned with a single photograph with a silver liner. Location: 1250 Capri Drive, Pacific Palisades, CA 90272.